Place cereal in a food processor. Pulse until very finely ground, then add melted butter. Pulse until fine crumbs form, then press into the bottom of an 8x8-inch baking pan. In a small bowl, dissolve gelatin into warm water. Add to a large stand mixer along with cream cheese, yogurt, and sugar. Mix until smooth. 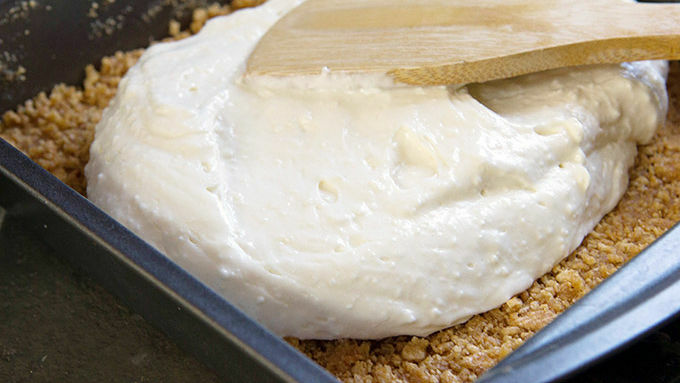 Spread half of the cream cheese mixture on top of the cereal crust. Even the layer out with a spatula. Divide remaining half of the cream cheese mixture into even amounts among 4 small bowls. Tint each with a different color of Betty Crocker neon food coloring. Stir until the color is evenly mixed in each bowl (use your discretion on color amounts, depending on how deep you want the colors). 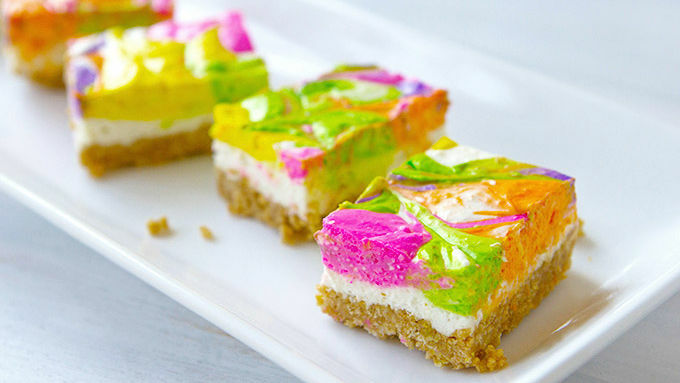 Place dollops of each color like a checkerboard across the top of the white cream cheese layer. 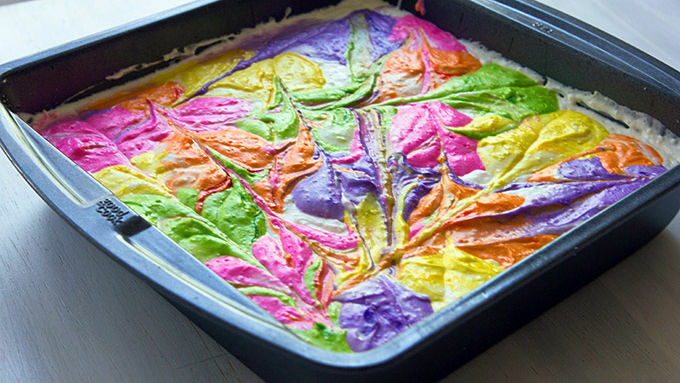 When all of the colored mixture has been spooned on top of the white cream-cheese layer, tap the baking pan several times against a hard surface to flatten the colored layer. 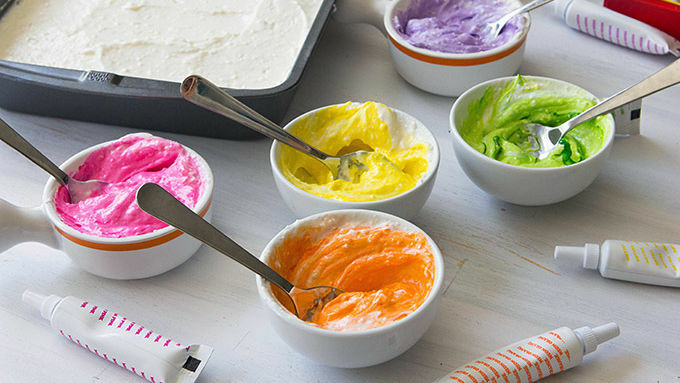 Draw a knife across the mixture in several directions to swirl the color. Refrigerate for 1-2 hours before slicing and serving. Ode to the 80s: These wild and colorful cheesecake bars will be the life of any party! And did we say they're no-bake? Yes, indeed. They're that easy. Some recipes are so brilliant, so utterly no-bake brilliant, that you simply have to stop and stare. This is one of them. Put on your sunglasses, and behold the neon glory. In just 10 short minutes, you’re ready to refrigerate. No oven, stove, or blazing hot fire pit needed. Hello, color wonderful!